Beauty Blog by Angela Woodward: How Can I Get Rid of My Greasy Hair? Greasy hair is a problem that thousands of people have all over the world. In addition to warm and humid climates, your hair will become greasier as you get older (until about age 30, and then it starts to get dry), as well as if you do physical activity, or if you get sick! So how do we fight away the unwanted shine? Here are my recommendations for you. I really can't stress how important it is to use good shampoo enough. You probably see it in half of these posts, but using good shampoo can get rid of half of your hair problems in a week! I love the TIGI Urban antidotes line! 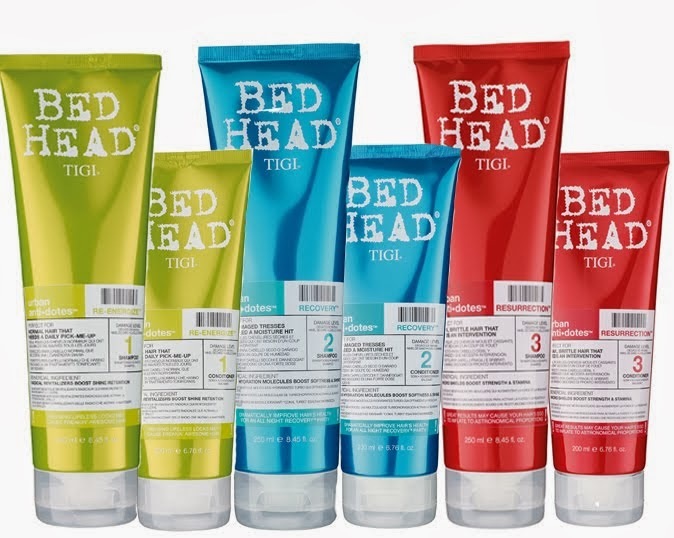 For greasy haired gals I suggest TIGI Bed Head Urban Antidotes Damage Level 1 Re-energize! This shampoo is the best and most versatile daily hair care shampoo out there! I wouldn't suggest Damage Levels 2 or 3 (Recovery and Resurrection) because they focus on hydration, and we aren't trying to add shine, but get rid of it! Contrary to popular belief conditioner isn't there to make your hair greasy. It heals and protects your hair. Make sure you are applying it on the ends of your hair and working your way towards the scalp (using very little on the scalp). Usually your hairs greasiness is a cry for help! Your scalp is to dry and is trying to correct that with a heaping of conditioners and oils. So don't give your scalp a need to do this! Usually your hairs greasy ways are due to a time where you had a lack of oils and conditioners on the scalp. You need to do a cleanse. This will be grease, a lot of buns will be worn and dry shampoo used. But this cleanse should shock your hair into saying "wow! I have way to much oils on my scalp, we need to dial it back!" and then when you go back to your normal routine you are covered! Here is a link to directions for the Ultimate Hair Cleanse! A lot of dirt, pollution and oils build up on your pillow case, so clean it once a week (at least). Just throw it in the wash with your other clothes, your hair (and most definitely your skin) will thank you for it. I know you think it's necessary, but it's not helping. I promise. As you can see Anamika, this post recommedn shampoo for oily haired gals.